MANILA, -- The Philippine Navy (PN) will be commissioning into service its two armed AgustaWestland AW-109E "Power" helicopters this coming Monday. Commissioning will be done at PN headquarters at Naval Station Jose Andrada along Roxas Boulevard in Manila. This was disclosed by PN public affairs office chief Cmdr. Lued Lincuna in a message to the PNA. The commissioning of the two armed AW-109Es will coincide with the retirement ceremony of PN flag-officer-in-command Vice Admiral Jesus C. Millan who will be leaving the service after reaching the mandatory retirement age of 56. His replacement will be announced on same day. The armed versions of the AW-109s will be equipped with machine guns, 20mm cannons and possibly, with air-to-ground rockets. For shipboard operations the aircraft has a reinforced-wheeled landing gear and deck mooring points as well as extensive corrosion protection measures. 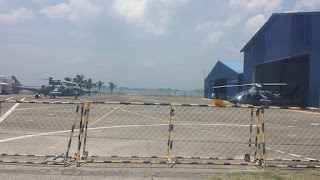 The Philippine Navy's two armed AgustaWestlamd AW-109E naval helicopters at Sangley Point naval air station, Cavite City.